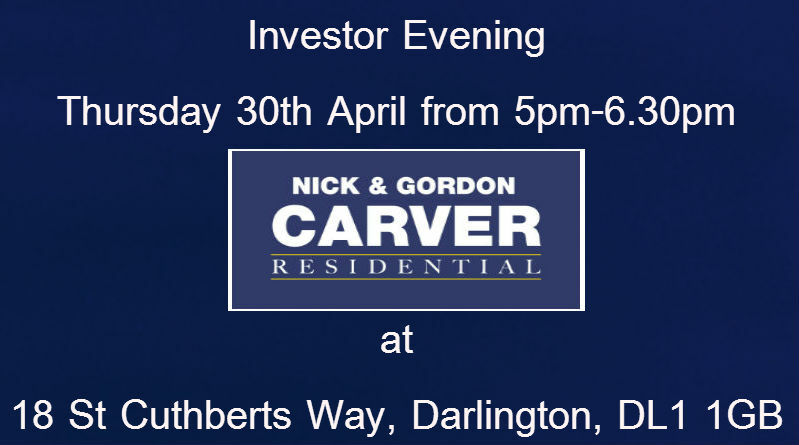 We are delighted to announce an informative and interesting evening on Thursday 30th April for anyone looking to invest in property. You may be aware that the rules on access to your pension lump sum are changing shortly, for those over the age of 55 and this could be an ideal opportunity! To reserve your free space please call us on 01325 357807 and aks for Rachel or email us at rachelc@carvergroup.co.uk. There will be a range of properties which we see as an ideal investment opportunity, providing a good monthly return on your investment. It is an ideal opportunity for anyone considering investing in a Buy to Let property, but not sure where to start, or what the implications are. We can also help with tax queries, finance, and the most sought after areas for people wishing to rent a home. There will be a range of experts on hand, to provide free advice and guidance.